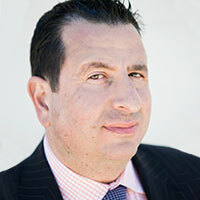 Haig Armaghanian - Founder, CEO - Haig Barrett, Inc.
Haig Armaghanian is one busy man. And that’s just how he likes it. On any given day, you’ll find him working with a longtime client like Toyota, collaborating with other Haig Barrett team members on their projects, penning a book he’s working on and squeezing in a yoga class. How is Haig able to do so much? One word. Passion. And five more very important words: He loves what he does. When clients call, Haig comes in, assesses the situation and diagnoses issues quickly. And he’s no wallflower. Clients look to Haig to shake things up with disruptive thinking—challenging the norm and looking for opportunities to improve. You might say Haig is known for creating “new normals”. And that isn’t the only new thing Haig is known for. After 12 years in leading management roles at Rio Tinto, Haig wanted to create a different kind of management consulting firm—one where the consultants are hands on, in the weeds and standing alongside their clients. Born and raised in the UK, Haig earned a Bachelor of Science (Honours Degree) in Chemical Engineering from the University of Surrey. That’s probably where all of that experimental thinking comes from. And that’s not the only kind of experimenting Haig is known for. Put him in the kitchen and he’ll whip up something amazing – French and Armenian dishes are his specialties. Other things Haig cherishes include good cigars, his steady yoga practice and marveling at what Emily, his beautiful baby daughter, discovers every day. What else should you know about Haig? Well, if he could have one superpower, Haig would choose the ability to teleport. With this power, he’d crisscross the globe getting different perspectives and then delivering informed recommendations to his clients. And if this superpower helps him beat LA traffic – well, that’s just gravy.